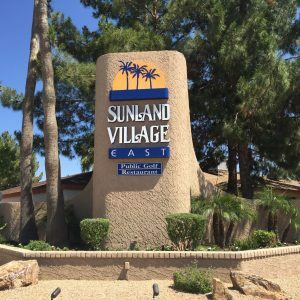 Sunland Village East 55 plus ARIZONA RETIREMENT COMMUNITY has a lot to offer the winter or year-round resident. SVE is located on Baseline Rd. 1/2 mile south and of HWY 60 & 1/2 mile east of Sossaman Rd. The community is less than a mile from grocery stores, hospital, pharmacy, fire department, and restaurants. There is also great shopping in every direction. With the communities numerous activities, events, leagues, social clubs, and affordable housing, this community is worth considering. Sunland Village East was established in 1984, by “Farnsworth Homes”. A total of 2435 single family homes, and condominiums / town homes were constructed between 1984-2001. When originally built there were nine basic floor plans with different variations of each available. Farnsworth Homes also offered many custom options. Floor plans range from 1000-2400 sq/ft. Features include: 1, 2 & 3 bedrooms, 1-3/4 – 2.5 baths, 1 & 2 car garages with golf cart storage rooms, covered patios and Arizona rooms. All of the homes in Sunland Village East are single level. Most of the homes were built on 6,500+ sq/ft. lots. Homes were constructed on cement slabs with exterior block walls, sheet rocked interior walls, copper plumbing, and a 200 amp electrical service. Roofs are shingled with several homes having tile roofs. The a.c./heat, dryer, stove, and water heater are all electric. Residents of SVE can enjoy the 18 hole golf course, restaurant / Sports Bar, three swimming pools, jacuzzi, exercise room, horse shoe, shuffle board, 3 pickle ball courts, several tennis courts and its own soft ball field. The community offers billiards, a computer lab, ceramics, lapidary, library, and wood shop. Community holds events such as dances, ice cream socials, music, pan cake breakfasts, day trips etc… . Depending on your social level there are many clubs and sport leagues you can join. SVE is managed by A Home Owners Association (HOA). H.O.A fees for two people are currently $500.00 (2016) annually. There is a onetime Capital Improvement (cap) of $750.00 (buyer responsibility) Salt River Project (SRP) is your electric utility provider. The City of Mesa provides water, sewer, and garbage service. Cox Communications provides cable TV, phone, and high speed internet service. Quest and Century Link also provides high speed internet and phone service to Sunland Village East residents. Jarl Kubat of ARIZONA RETIREMENT COMMUNITIES | JustJarl.com –Specializes as a buyer’s agent, selling homes in retirement communities throughout the Phoenix Metro area. I will work hard to get you the best possible price, terms, and conditions on the purchase of your new home in Arizona. We look forward to serving all of your real estate needs. 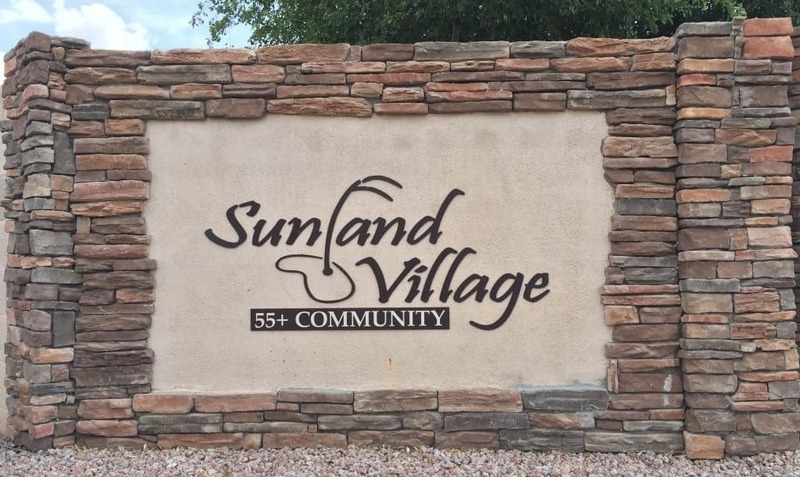 Sunland Village is a 55 plus community with, much to offer the winter or year-round resident. The community is located on Greenfield Rd. 1-1/2 miles north of HWY 60. The community is less than a mile from grocery stores, hospital, pharmacy, fire department, and restaurants. There is also great shopping in every direction. With the communities numerous activities, events, leagues, social clubs, and affordable housing, this community is worth considering. Sunland Village was established in 1974, by “Farnsworth Homes”. A total of 2685 single family homes, and town-homes / patio homes / condo’s were constructed between 1974-1984. When originally built there were nine basic single family floor plans with different variations of each available. “Farnsworth Homes” also offered many semi custom options. Floor plans range from 600 sq/ft (condo’s / patio homes) -2300 sq/ft (single family homes). Features include: 1, 2 & 3 bedrooms, 1-3/4 – 3 baths, 1 & 2 car garages with golf cart storage rooms, covered patios and added-on Arizona rooms. All of the homes in Sunland Village are single level. Most of the homes built are on 6,500+ sq/ft. lots. Homes were constructed on cement slabs with block exterior walls, sheet rocked interior walls, copper plumbing, and a 200 amp electrical service. Roofs are shingled with a few homes having tile roofs. The a.c./heat, dryer, stove, and water heater are all electric. Residents of Sunland Village can enjoy the 18 hole golf course, restaurant, three swimming pools, jacuzzi, exercise room, horse shoe, shuffle board, and tennis courts. The community offers a computer lab, ceramics, lapidary, library, and wood shop. Community holds events such as dances, ice cream socials, music, pan cake breakfasts, day trips etc… . Depending on your social level there are many clubs and sport leagues you can join. Sunland Village is managed by A professional Home Owners Association (HOA). H.O.A fees for two people are currently $437.00 annually (2012). There is a one-time capital improvement fee of $1,000.00 (buyer responsibility). Salt River Project (SRP) is your electric utility provider. The City of Mesa provides water, sewer, and garbage service. Cox Communications provides cable TV, phone, and high speed internet service. Quest also provides high speed internet and phone service. I specialize in selling homes in Arizona Retirement Communities throughout the Phoenix metropolitan area. My promise to you – is to help you stretch your retirement dollar as far as possible. We will work together to find the perfect home in the right community. I look forward to serving all of your real estate needs. The link below will offer more Sunland Village Community Information, current HOA fees and the newest listings and price reductions.